Cap 8.0-16.0 cm broad, convex, expanding to plano-convex or plano-depressed; margin decurved, then straight, not striate; surface glabrous, dry, dull-olive at the disc, lighter at the margin, background color cream, sometimes showing through the primary olive pigment; in age, cap often developing reddish, brownish or purplish areas, occasionally entirely reddish; context white, firm, unchanging, 1.0 cm thick at the disc; odor not distinctive; taste mild. Gills adnate to adnexed, whitish and crowded when young, fairly well separated and cream-yellow in age, up to 1.0 cm broad, occasionally forked near the stipe; lamellulae absent. Stipe 8.0-13.0 cm long, 2.0-3.5 cm thick, stuffed, more or less equal, the stipe base sometimes pointed; surface glabrous, slightly wrinkled to uneven, flushed pink over a pallid background, developing brownish discolorations where handled; context white, soft, unchanging when injured; partial veil absent. Spores 8.5-10.5 x 7.5-9.0 µm, subglobose to obovoid, conspicuously warted, not reticulate, ornamentation amyloid; spore print pale-yellow. Solitary or in small groups in mixed hardwood-conifer woods; fruiting from after the fall rains to mid-winter. Unknown according to the literature. Local experience has shown it to be a very good edible mushroom. 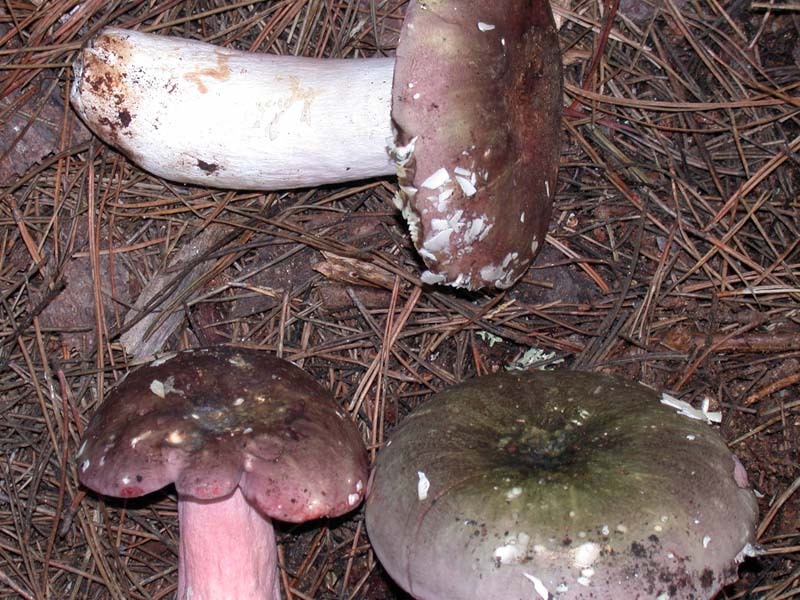 Despite the species name, the cap color of Russula olivacea is variable, olive at first, later often suffused with reds, purples and browns. 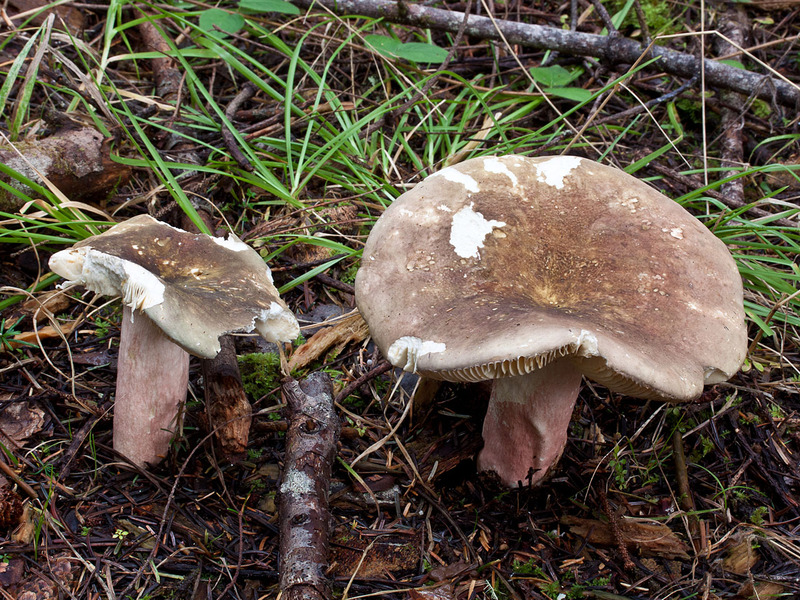 This often large Russula is also recognized by a pinkish-vinaceous flushed stipe, mild taste, cream-yellow gills, and spores that are warted, not reticulate. 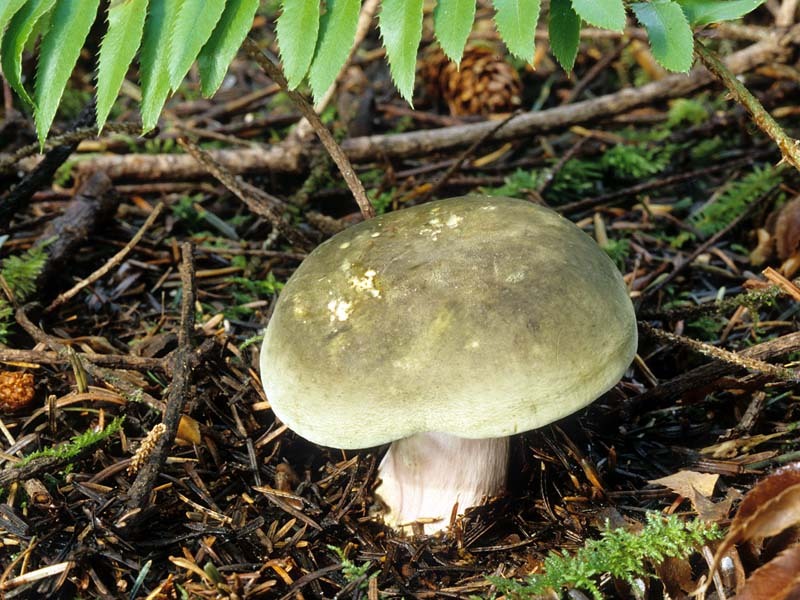 Russula olivacea is one of several greenish Russulas that occur in California. 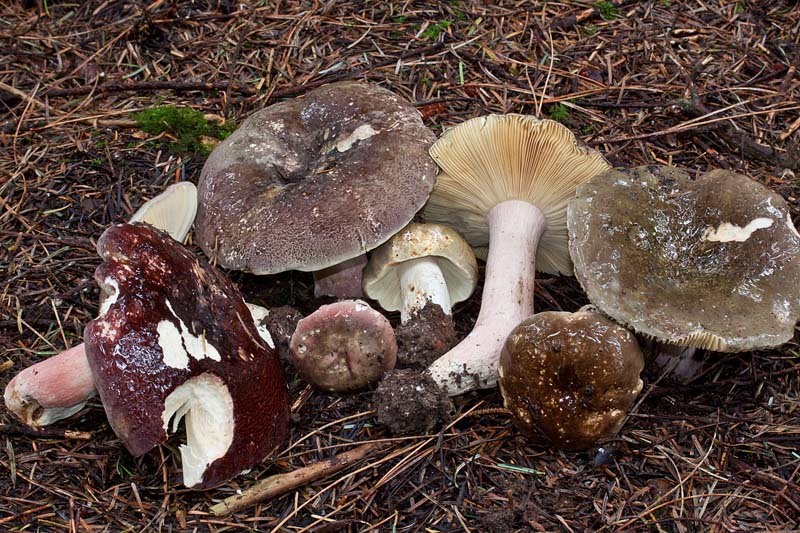 These include Russula aeruginea, R. heterophylla, R. smithii, and R. urens. 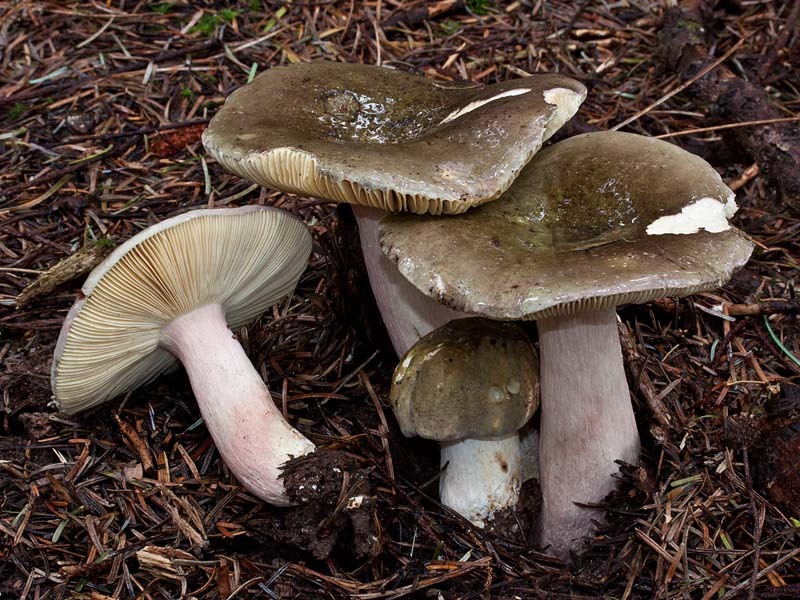 Russula aeruginea is distinguished by a greenish cap that does not become tinged reddish or brown with age, while Russula heterophylla and R. smithii can be separated by their white spore prints. 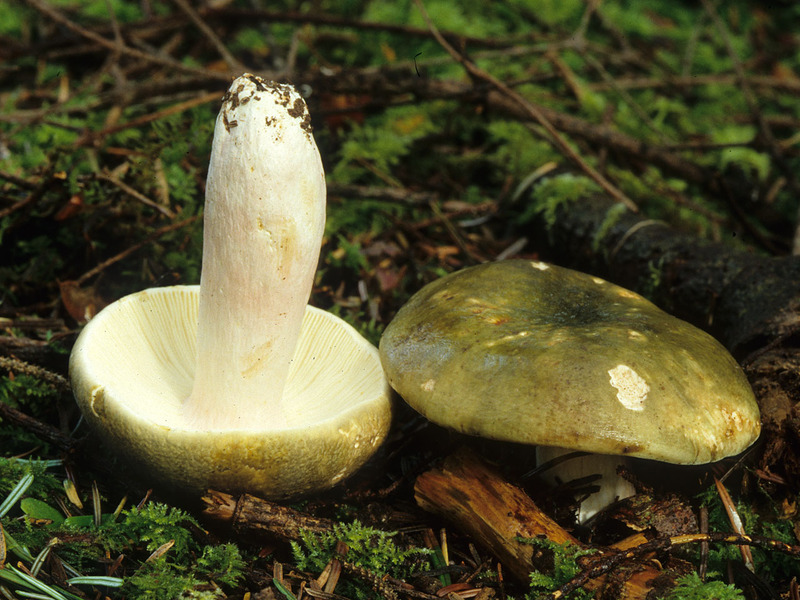 Russula urens, a smaller species, can be differentiated by an acrid taste.